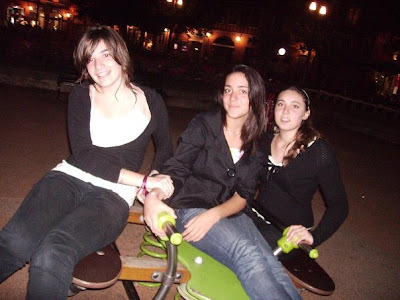 OMG my best friend from France like, TEN YEARS ago added me on Facebook and she was linked to my French school and there were photos and everything and omg I miss it so so so much because it's just WORLDS APART from Singapore. She's the one in the middle, her name is Cecile. Omg I'm crying very hard I don't know why. It was so long ago. But somehow seeing the pictures of her at the school and college I'd have attended if I my parents hadn't divorced makes me realise how different my life has become. Seeing the life I was supposed to be living makes me miss it terribly. It's not that I think Singapore is worse or vice versa. It's just that there's this whole parallel world I belong/belonged to but it's all gone now. I miss her so badly not because we're anything to each other any more now. She was my best friend when I was a kid. But I miss her so badly because she represents everything I lost. She still looks exactly the same.